In the fall of 2011, Florida Governor Rick Scott proclaimed that his state didn't need any more anthropologists, and that public money would be better spent educating scientists. Then in January, a study found that the unemployment rate among recent graduates with bachelor's degrees in anthropology and archaeology was 10.5%, surpassed by few other majors, and that anthropology majors who did get jobs were also among the lowest paid. Of course the study only took undergraduate anthropology majors into account — the prospects are brighter for people with graduate degrees. Still, it's worth paying attention to these details as the U.S. faces steep funding cuts for the sciences in 2013. 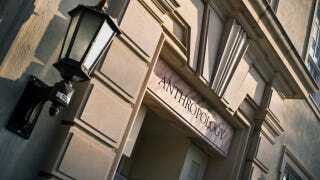 Is anthropology going to be one of those fields that gets put on the chopping block so that universities can save medical research and Earth sciences that are more easily turned into money-making products for hospitals and mining companies? Anthropology is also one of those rare fields that combines elements of science, social science, and humanities research. Certainly one can focus entirely on physical anthropology, which is essentially a hard science. But more often, anthropologists are trying to understand human societies both from an evolutionary perspective and a social/cultural one. This makes it one of the most important fields going forward into the future, because many experts believe interdisciplinary work in areas like environmental science, biotech, and space engineering will lead to the most important innovations. But it also makes anthropology a tough sell. Clearly Gov. Scott didn't understand the scientific importance of anthropology when he made those comments in Florida. But in any field where human activity plays a key role, from medicine to climate change, anthropologists will always be necessary. And of course anthropologists will continue to be necessary in order for us to understand the development of human societies, pre-human cultures, and the new communities that we are still forming now as the world changes around us. Read Gibbons' full essay in Science.